It was one of those interesting quirks of timing that saw global adverts for a new Reserve Bank Governor being published at around the same time as the outgoing Governor's efforts to rein in a major bank economist were being made public. Doubtless said outgoing Governor Graeme Wheeler will have been less than thrilled that his recent letter to BNZ chief executive Anthony Healy was publicly aired thanks to BusinessDesk journalist Paul McBeth and the Official Information Act. But surely, anybody in a high and public position has got to know that they can't take the sort of action Wheeler did without there being at least the chance that news of their actions will be made public. If you are going to take the drastic, actually, no...extraordinary... step of asking a bank that your organisation regulates to effectively censor the views of one of their (senior) employees you've got to be prepared for some consequences. This will be an unfortunate note on which to end what has been unfortunately - in my view - a rather mixed five-year term from this Governor. I give him great credit for the way the loan to value ratio restrictions were first introduced in 2013, but I think his tenure was stained by two frankly bizarre speeches he gave in October 2015 and in February 2016. In general terms both of those speeches, if read in entirety, could reasonably leave the reader with the impression that Wheeler was a most reluctant interest rate cutter and, specifically in the case of the February 2016 speech, had no intention of further cutting rates at all. 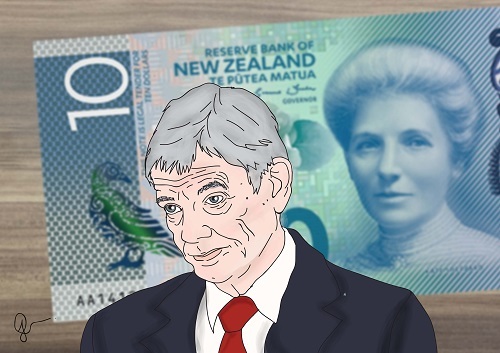 It was the bombshell RBNZ cut barely a month later in March that prompted BNZ's head of research Stephen Toplis to remark in an Economy Watch publication that: "This is the second time in two years that we have listened to a speech by Graeme Wheeler and been stupid enough to pay attention to it." Now yes, that's pretty caustic. But for me, as someone who had already by this point penned an opinion piece under the heading "Graeme's tyre-shredder" and bestowed upon Wheeler the title "King of the U-Turns", I had a certain sympathy. People like me are just made to look like idiots if we believe what someone says and then wrongly predict what will happen based on that. I'll live with it. I've got broad shoulders. Someone like Toplis gets to look silly, yes, but also potentially - and I'm obviously not privy to the workings of a commercial bank here - but might base advice internally to the bank and to bank clients that costs both parties money on what proves to be erroneous information. That's a bit more serious. As I say, I don't know what might have gone on behind the scenes, but while Toplis's tone was harsh, I certainly understood where the frustration was coming from. Anyway, go forward over a year from that point and we had the May 2017 piece written by Toplis, which led directly to the letter from Wheeler. I thought that particular article from Toplis was fairly strong stuff - that's why I did an article on it - but not unreasonable. And the key point was that Toplis argued his case in an intelligent and articulate manner. People don't have to agree with you, but if you construct your argument in a clear and lucid manner and with supporting facts and figures, that should be respected. The biggest 'crime' Toplis appears to have committed is that he doesn't agree with the RBNZ's view. An important point to make is that the Reserve Bank and its Governor are public entities, paid for by the taxpayer and accountable to the public. If we want to criticise them because we, reasonably, and with supporting logic, think they've done something wrong or made a misstep or are going about things the wrong way, then that's our right. This is supposed to be a democracy. A public body is open to public examination and objective criticism. People in high office need to, in the colloquial vernacular, grow a pair, and accept that not everybody will agree with them. That's what they are paid the big bucks for. In Wheeler's case around 650,000 of them. I'm afraid in the past five years I have seen signs of development of a kind of 'us and them' group-think at the RBNZ - and quite defensive too. And also I see signs of something I don't remember from covering the RBNZ much more closely particularly in the times of Don Brash as Governor - an implied intellectual snobbery. I can't recall in the past five years the RBNZ having explicitly put up its hand and saying: "We made a mistake." That's despite the erroneous series of interest rate hikes in 2014 that had to be reversed. And that's despite the confusion and apparent u-turns in the midst of those two Wheeler speeches referred to before, as well as other occasions where RBNZ utterances caused the dollar to go up - when it very much wanted it to come down. Now, nobody says this economics and monetary policy stuff is easy. It isn't. Not. At. All. Any central bank that made all the 'right' calls on the economy would have done so by accident, such are the variables. But if you make a mistake, be human enough to admit it. That's what humans do. Make mistakes. The RBNZ treasures the independence it has of the Government. It has always been seen as a very good thing and an important thing. Clearly it cannot be seen as a good thing that a body which itself enjoys such independence is then seen to be leaning on a bank that it regulates and which it permits to operate as a bank. The messages that sends are not good. It is interesting in this respect that the advert for a new Governor actually raises the independence issue, stating that the successful candidate will demonstrate "an appreciation of the significance of the Bank's independence and the behaviours required for ensuring the long-term sustainability of that independence". If it was up to me I would add to that something like: "The successful candidate will welcome diversity of opinions both inside and outside of their organisation. Ability to be very thick-skinned and appreciate that not everybody sees the world the way you do would also be an advantage." Bit rich of Bill when Bill and John and their motley crew have failed to act with any effect over the last nine years. Seems like they're always looking for someone else to blame. Something that is all to common in many Government Departments is that the people at the top believe they are beyond questioning and untouchable. This is an extremely destructive attitude as others below they start believing it to the be the case and start ignoring evidence to the contrary. At that point they are not doing their job. I don't believe that Wheeler is that far gone as I believe they are operating in the right region even if it may be for the wrong reasons. That said scrutiny of all branches of Government is very important.